Eat Can a Vending Machine Ever Deliver Healthy Food? Can a Vending Machine Ever Deliver Healthy Food? Or do the people just want Snickers and french fries cooked in beef fat? You’ve been there: walking around your office, or a hospital, or an airport, slowly realizing that your only meal will be dispensed from a vending machine, and will probably be a Snickers bar or greasy bag of Ruffles. “Vending is probably the least glamorous sector of the food industry,” states writer Richard Ehrlich in an article for The Guardian. He explains that while it might not be glamorous, the vending machine industry is a very lucrative business, with profits around £1.65bn (or $2.2 billion) a year. It is an industry currently based on the potato chip and chocolate bar, but nowadays, vendors are recognizing that they need to branch out by offering foods that are not designed to deliver maximum amounts of fat, sugar, and calories. But as much as you wouldn’t want only greasy, caloric options when eating from a vending machine, you wouldn’t necessarily want low-fat baked chips or sugar free sodas, either. 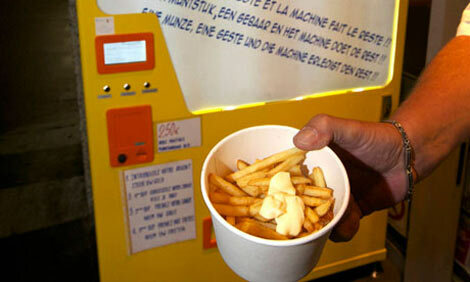 Thankfully, vending machine foods are being developed that are both healthy and appetizing. Ehrlich attended Avex, the annual exhibition of the Automatic Vending Association held in June, and found out that students at the Culinary Arts Management faculty at University College Birmingham are creating and devising commercial plans for fresh, healthy snacks and meals that could be dispensed from vending machines. Some of the products that Ehrlich sampled and judged while at the event were Gail Pastries, “a gluten-free line with five different savory fillings,” (which won the top prize), Caulipockets, “pasties made with gluten-free flour made from cauliflower,” and Dog in a Box, “a decent hot dog with various trimmings including fine coleslaw.” Ok, the Dog in a Box doesn’t sound too healthy, but the gluten-free savory pastries seem both healthy and delicious. The real question here is whether people will grab for the the healthy pastry over a Snickers when presented with both options.